BCP Veterinary Pharmacy formulates sterile injectable solutions, suspensions, and oils for intramuscular and subcutaneous routes of administration. 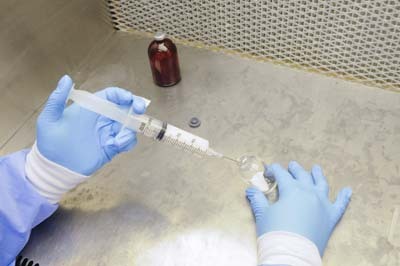 In addition to the active drug, the injectable preparations consist of a number of excipients including vehicles, buffers, antioxidants and preservatives. All injectables are free from particulate matter and nonpyrogenic and are sterilized using methods appropriate to each individual drug. Injectable Solutions: chlorpromazine, chlorpheniramine, diphenhydramine, amitriptyline, metronidazole, phenobarbital, apomorphine, calcium edetate disodium, ACTH gel, bethanechol, hyaluronidase, CaCo copper (also available with strychnine), prochlorperazine, hydrochlorothiazide, and fluorescein. Injectable Suspensions: bovine protamine zinc insulin, prednisolone acetate, prednisone, betamethasone, stanozolol, trimethoprim/sulfadazine, penmycin A/Z (streptomycin, chlorpheniramine, dexamethasone, penicillin G procaine), methylprednisolone, triamcinolone diacetate, hyathal (hyoscyamine, streptomycin, chlorphenarimine, penicillin G procaine), selenium/vitamin E, and vitamin A& D aqueous. Injectable Oils: progesterone, testosterone cypionate, estradiol valerate, estradiol cypionate, and estradiol/progesterone. Shelf Life: May vary depending on the drug. Please ask a BCP pharmacist for further information. Storage: May vary depending on the drug. Please ask a BCP pharmacist for further information. Packaging: Available in 5ml, 10ml, 30ml, 50ml, and 100ml sterile glass vials.